Hello! Here I am again, for the last time until the next tour! So sad, so sad. Anyway, after the Niagara Falls visit on Thursday, we had a concert quite a way away from Toronto in Hamilton. 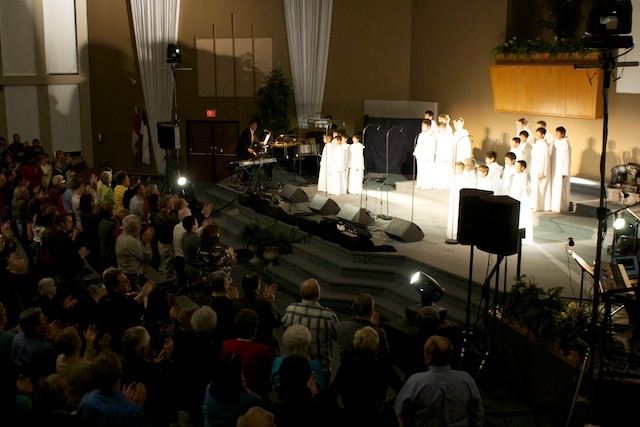 We were performing in a nice church called West Highland Baptist Church. It was quite big, and so was the audience! It was a great concert, and it went really well. The next day was a rather interesting one. We got up late, had breakfast etc., and then we relaxed in rooms for a while. The next day we had to sing at a service in Our Lady Immaculate Church in Guelph. So we had to have a practice for that as well. 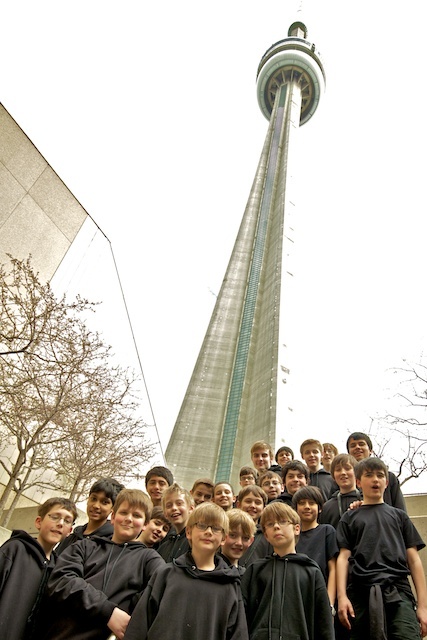 But, later on in the day, we went to the CN Tower! We also went on a boat trip to Central Island. Sadly most of the attractions were still closed for the winter but we did some serious tree climbing and the view of Toronto was impressive indeed. The next day was packed with lots of things to do; it was Easter Sunday. In the morning we sang Mass in the Church of our Lady Immaculate in Guelph – at the end we sung the Hallelujah chorus with the cathedral choir – plus a full band of strings, brass and organ – up in the loft. It was great fun – and the congregation clapped for a long time at the end! After that, we were treated to a delicious lunch by the church helpers, followed by a few hours of relaxation before having a sound check for our concert – which was in the same church. It’s a lovely building; it had a fantastic acoustic – and it was a near full house, which is amazing considering the size of the place. At the end of the concert, equipment was packed away for the last time and we said our farewells to the crew – our Canadian roadies called Sean and Anthony who brought all the gear we had to rent, and our own crew who were going back to England on a different flight to us boys and chaperones. We got back to Toronto at about half-midnight-ish, only to get up again at four to go to the airport. That was great – for once, the coach was silent! Anyhow, when we got to the airport we had a short break (with a Tim Hortons breakfast) and we were on our way. At the time of writing, we are currently over Ireland, and soon it will time for us to be going home – well yes, really! Thank you so much for supporting us in our first run of concerts in Canada; we hope to come back soon! Hello Libera! Thank you for the blog – I have really enjoyed “following along” with you in your travels. I managed to see three of your concerts, St. Micheal’s, Hamilton and Guelph. Each one was nothing less than heavenly! Thank you for the gift you give to all of us, each one of you! Good luck with your exams. Thanks to the writer. Whoever it is, he’s very good. It is nice to hear details about the concerts as well as the accounts of your travels and “free” time activities. All the best to all of you. I hope that you might visit the Northeastern United States in the near future. 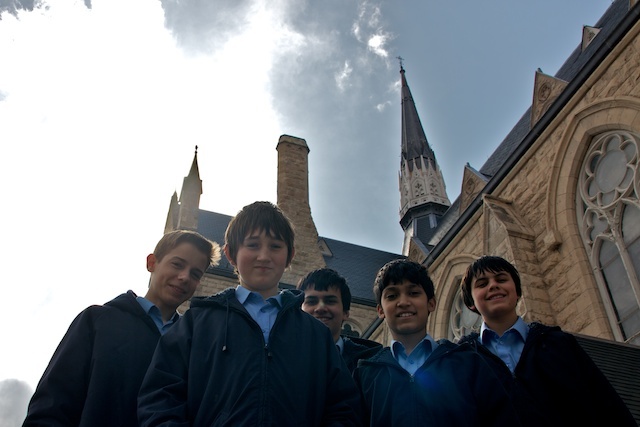 As per your fan page the “Libera Nation”, all over the world, keeps on growing. I know I already commented elsewhere, but I just have to say again how amazing it was to see you in Hamilton and Guelph! I wish there’d been a meet and greet so I’d have a chance to gush in person about how much your music means to me, but in the end I’m glad that you didn’t schedule one. It would have been far too much, and I’m afraid we already ran you ragged! Thanks again for coming, for sharing your music, and for blogging about the experience to we hard-n-fast Libera fans can feel more connected. Best to all and especially good luck to those writing exams! Thanks for all these posts, it is very interesting hearing about your trip and the concerts. I hope every one enjoyed it all. I was lucky enough to see you all in Atlanta last year and I will always remember that. Good luck to you always and keep up the good work. I would like to express my sincere appreciation for the beautiful music that you shared on your Canadian tour. I myself had the pleasure of attending your concerts in Kitchener and Guelph. You are all very talented and professional and have certainly gained many new supporters in Canada. I know that many young children have been hearing your music for the first time, and it is my hope that hearing you will foster an interest in choral music in these young people. I would also like to thank Mr. Prizeman, his staff, the chaperones and others who give unselfishly of their time and resources in order to bring the ethereal sound of Libera to other countries. Finally, I wish to express my gratitude to the parents and families who are committed to and support their sons’ involvement as members of Libera. Please come back to Canada in the near future. My best wishes to all of you. Glad to hear that you made it safely back home! Also, it’s great that you were able to make it over to the islands. I wanted to go to Tommy Thompson Park, but it rained/snowed/sleeted each day that I was there. Again, thank you for the lovely performances, and I hope to see you soon! 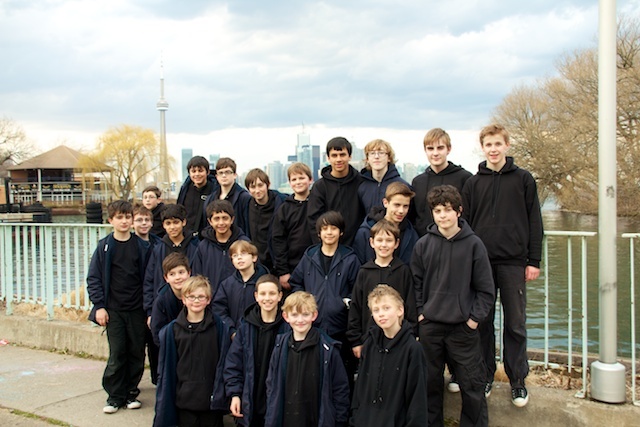 Just a few short weeks ago, Libera arrived in Canada, it was like a fantastic dream come true, it was like we won the lottery when Libera announced, “our Spring Tour is crossing the pond to Canada,” to the province of Ontario, southern Ontario if you wish. Like good times, they always seem to rush by so quickly. But for many seeing Libera live in concert during this tour, some for the first time, it was a wish come true!!! Now that you are safely back home in south London in England everyone with Libera can cherish the many wonderful memories and experiences you have enjoyed during this tour. Yes a lot of work and effort was put forward by all the boys on the tour!!!! We fans are most grateful to the Libera support team whose efforts spell success, throughout the 7 live concert performances. Thank you Libera for the uplifting memories which will stay with us forever!!! Hi Libera! I’m that crazy girl who was in the front row in Hamilton wearing the “I love Libera” hoodie! Thanks so much for posting the final instalment to ya’lls blog!! I really enjoyed reading it all! It took me a minute to find myself in the first picture, but I then realized it was because I was a few steps too close to the stage – oops! Guess I was just really excited! Well anyways, the concert was really truly amazing, and I just want to thank ya’ll so much for doing what you do! Sounds like ya’ll had a ton of fun on your tour! Hopefully I’ll be able to see you guys again soon! Thanks for the blog on the tour. It helps make up for my not having been able to be to one of your concerts just yet. Please keep Harrisburg/Hershey, Pennsylvania in mind sometime soon. aah, can’t wait for the next tours. i want to read your blog posts.. will there be a summer tour? got to love the typical Libera humour sprinkled here and there. Libera, thank you so much for your wonderful performance in Guelph. It was AWESOME. Listening to you perform felt like being in the presence of angels. You have a wonderful gift. Thank you SO VERY MUCH for sharing with Canada. We are looking forward to having you back very soon. Please do come back to North America where I’m reasonably certain you will be more than welcome. Libera, what a great time you must have had in Canada and what Joy you must have brought to the many people who attended your concerts. I have visited Canada twice myself and know many of the places you visited. Just a pity I couldn’t have been there while you were visiting.That would have been two great things put together wow! Glad you discovered and liked Tim Horton’s wow all those doughnuts. Hope to hear more from you all soon, best wishes. Thank you very, VERY MUCH for giving my soul some peace and comfort! Have to admit! Every moment (since I first heard about your tour in Canada), I really dreaded that you might not like it here…. For some reason. Of course I knew I was wrong, but my sudden fear always overpowered me. I’m very pleased to hear that you enjoyed your stay in Canada, and trust me! Canadians simply LOOOOVED having you here, that’s for sure! Maybe the Lord be with you all! Thank you for your great concerts in Canada. I was able to see you at your first 6 concerts, which where wonderfull. I had to fly home and return to work so I missed your last concert in Guelph, which was a real shame. Ill look forward to your next series of concerts in the near future, and hopfully a concert in the UK. Welcome home, just in time for the wedding lol, see you all again soon. I’m glad that you guys had an awesome time in Canada. It’s to bad Sam and Josh couldn’t be there to see it. They would’ve loved it. Even though I’ve never been there myself. I hope that when I come back to visit the website, it’ll have something with the US in it. Possibly Arkansas. Just staying hopeful here people. Well lots of Love to all of you. God Bless. 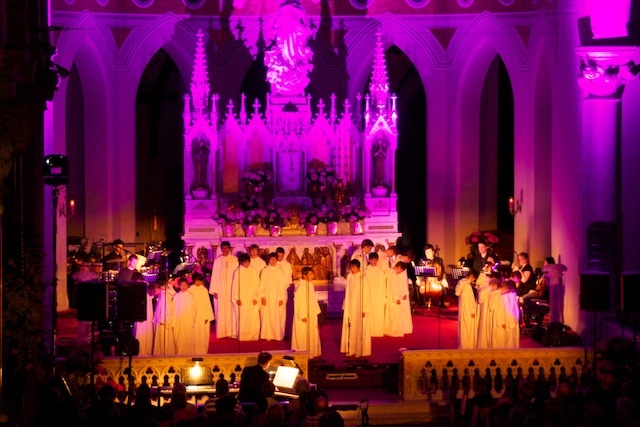 LIBERA ROCKS!!!! I just want to thank all the members of Libera all the way down to “Moose” the mascot. It was great having you all visit us here in Canada and I for one would like to thank you for taking the time to write your Blog as it has been great to read all about the fun you had. I so enjoy reading of your adventures and just to say it, I agree totally about the “Glass floor,” it has scared me each and every time I’ve been up there. Again, thank you for coming and I pray that you all have a wonderful and safe rest of 2011. For those of you writing exams, I wish you all the best. Always remember, that you are welcome back anytime you want to return to Canada. Congrats on a highly successful tour of Canada, hope you enjoyed yourselves as well. Good to have you safe Home again, we look forward to your next UK concert. Hope to see you soon. I just wanna say…I love you guys!!!!! -.- You guys are the kind of people that make the world go round. Thank you for your beautiful voices. Listening you guys music every morning before heading to work 🙂 Hope that Libera will come to San Diego, California!! The 3 concerts I saw were all fabulous and I’d like to thank the choir and everyone who helped bring them to Canada. Robert Prizeman is truly a genius and I’ll be forever grateful that he shares his talents with the world. The lads were amazing. I’ll never forget the amusing episode involving Ralph and Stefan at the very end of the first concert. I doubt anyone else noticed but I happened to be watching, and I think they were still joking about it when I saw my second concert a week later. I might have been wrong but I think there were a couple of minor adjustments made for the final concert and it brought a tear to my eye at one point to see a young boy leaning towards the mic of an older boy to help out with the very high parts that suddenly aren’t as easy to hit! Thanks again, not only for coming to Canada and the amazing concerts but for the hours of listening enjoyment I’ve gotten from your CDs. Truly music from heaven. Hello, guys.,I would like to congratulate you all for your very Successful Canada Tour!! I wish that more successful and meaningful concert/tour will be more great and awesome. You are all astonishingly did all best.. I almost do listening to your songs every-night before to sleep and in a day while having a work. I am hoping guys that your album will be available here in Bacolod City, Philippines.., I am also looking forward for your future concert (if ever that there will be) here in Bacolod City, Philippines. I am but a small LIBERA fan but through my effort i will come to see you all. Before to end, i want to ask guys if Joshua Madine still singing for the group. by the the way thanks for this blog it really gives updates…. I have become a great fan & listen to Libera daily, either on youtube or dvd. I was unable to see you all in Ontario as it is so far away from here. I am located on the west coast on Vancouver Island. I hope you come to the west coast sometime. Vancouver would welcome you i’m sure. If you make it to Vancouver I will be there for sure. When you have next concert in London? I am from Finland and I would like to visit the concert before I go to Finland. Hello Good day! I’m a big fan of libera i always listen to your musics and videos. btw i already saw your new music video “The song of life” and it’s really great. I hope you guys will have another concert here in Cebu and have your Meet and Great because the last time you visit here in Cebu i was not able to meet the boys so I’m hoping that you will have your concert here in Cebu, Philippines and I’m gonna meet the boys and if ever you can visit the office of my mom and have time with the children you can even play with them and have a mini concert ate the center. More Power and God Bless..! Congratulations!!! U guys are great! I barely know your work, but I’m already a huge fan! If you do not come, I’ll come for u in UK! Thanks for the amazing voices! After hear the new releases (eternal light, lullabye, song of life), I woud like to recognize the talent, good taste and work of Peter the Director of Libera. The boys have the nice voices but they are the Peter’s instruments as a musician. Keep working Peter and keep the same misthics in the choir. I have recently become a fan of Libera. I find the music and harmonies very peaceful. I lost my mom to Alzheimer’s a few weeks ago and some of your songs have really helped. Especially Going Home and Time. Time reminds me that God is in control and has us in the palms of His hands. Going Home is a reminder that my loved ones and Christ are waiting for me. God bless you all so much. I will be listening to your beautiful harmonies. You are absolutely awesome! but when you come to Finland? Hello, Libera~I’m listing to your songs now.. I listened to Libera today for the very first time, and…well… now I’m hooked! 😉 A friend who’d attended your Hamilton concert in April, placed a Libera video link on his Facebook page. I’ve thanked him, and I now thank you too. You’re an inspiration to yours, and to EVERY generation! No other ‘boy band’ even comes close! Welcome to Minnesota and the Twin Cities on your tour in July. Having enjoyed your beautiful music for years, I am so pleased you will be singing here! Will you include wonderful pieces like “Voca me” and “Time” in your concerts? I hope so! What are the venue details? I am very interested in oftaining tickets for your performance in St. Louis. I lived in St. Louis for many years and will be visiting friends there on Aug. 3rd. I hope that the performance will be at the St. Louis Cathederal on Lindel Ave.
hello my name is Xavi, I have 13 years, I live in Spain (Mallorca) your music is splendid. I am participating in a choir (Sant Francesc de Palma), and begin to control the guitar and piano and I’ve never heard such wonderful voices. I used to be soprano but now I come to tenors. I would love if you could come to Spain would not break your show. I admire the voice and the music you have and do. I however small, I understand about music in my choir I started 7 years ago and I’m still in and I tell you (you are the best). please, try to go to Spain if you can, if you can not follow you no matter heard by the computer . thank you, admire you. My name is Vitus Madine. I am now 15 years old and I live in Taiwan, Kaohsiung, and I know you often go to Europe, American and Japan.I have participated in choir in my 8 years old.Then, I think this is just entertainment.Now I quit. I think that gave people hope. Thank you. I heard of St. Mark (France), Vienna, Regensburg (Germany), except I like your way of singing hope you can hear the beautiful sound of Taiwan. You guys are awesome! Could you do a new “Light the Candles”? It is my favorite. Wow! Great to hear you guy’s got home ok after the tour here in Canada. Sorry, I just missed seeing you guys by a month. Just found your Blog site and will follow your news close from now on. Hope to see you in Canada again and will not miss you next time. I love you guys so much! you guys are amazing!! I love how high you guys can get!!! It’s sooo cool!!!!! I hope you guys come to the U. S. soon. That would be cool to see you guys in concert!! you guys should come to Aberdeen, South Dakota!! I would love to see you guys i concert!! Hope to see you guys soon!! !